These fancy looking Italian Sweet pepper tempt you to use it in a whole. 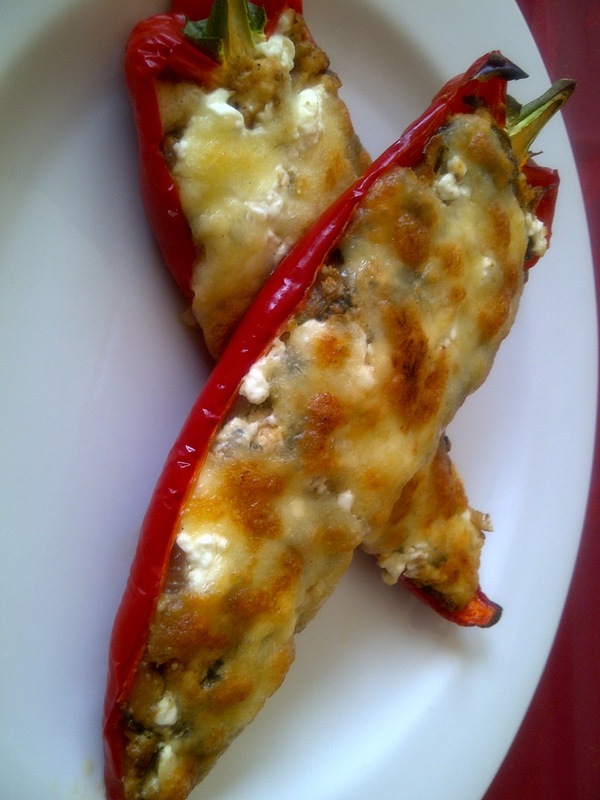 Its mild taste is perfect for a stuffed recipes. I am using Indian spices to give this Italian pepper a perfect twist of taste. The Italian sweet pepper is a variety of the species Capsicum, like bell peppers and chilli peppers. Pepper is stuffed with cottage cheese and spinach topped up with mozzarella and grilled. Grilling the mozzarella make a crust over and work as a cover to the stuffed filling inside the pepper. Another simple and effective recipe. 1)Heat oil in a pan, add cumin let it splutter for minute. Add chopped onion toss it till it sweat for a minute add tomato and green chili. 2) Add blanched and drained spinach, gram masala, salt and pepper. Toss it on a high flame to make the stuffing dry. Turn off the heat. 3) Add cottage cheese to the mixture and mix well. 4) Cut the Italian sweet pepper horizontally in half from the stalk till the tip. Clean the inside seed slowly. Brush the outer surface with some oil. 5) Stuff the filling tightly. Top it up with fresh mozzarella cheese. 6) Grill it at 150 degree for 15 minute when you see the mozzarella melting and forming a light brown cover. 7) Enjoy it with you favourite pasta or some brown rice.